The Skinny: An amazing genre film which reaches new heights of intensity. Ringo Lam's gritty prison movie is meaty moviemaking at its best, and Chow Yun-Fat turns in a peerless charismatic performance. The Hong Kong prison movie against which all others are measured. Ringo Lam's near-plotless portrait of brotherhood and political chicanery in a Hong Kong prison is terrific storytelling, and more than adequate justification for his celebrated career. 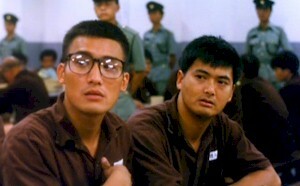 Also, Prison on Fire features a sensational performance from Chow Yun-Fat. Chow plays seasoned inmate Mad Dog, whose carefree attitude towards life in prison belies a deep understanding of the dangers of prison politics. He shows the ropes to new inmate Lo Ka-Yia (Tony Leung Ka-Fai), who's in for involuntary manslaughter. Unfortunately, his righteous attitude gets him in immediate trouble. It isn't until Mad Dog steps in that Lo learns how he's going to survive his sentence. If only it were that easy. The prison is also home to Boss Hung (a menacing Roy Cheung), a high-ranking prison guard who uses wily tactics to control the inmates. He plays the various prison gangs against one another, leading to infighting and numerous inmate betrayals. Ultimately, things come to a head in a harrowing prison riot which leaves more than one inmate - and prison guard - scarred. Though the acting and events are occasionally histrionic, the film manages to involve rather than alienate. This is partially due to Ringo Lam's celebrated grim and gritty style, which is a far cry from the Full Contact excess some might expect of him. His focus in Prison on Fire is character and circumstance, and not really plot. Events seem to happen with minor development, though the consequences of even the most minor incidents have a great effect on our protagonists. Tony Leung Ka-Fai turns in an effective performance as stiff inmate Lo, but the film is pretty much Chow Yun-Fat's show. As Mad Dog, he goes from glib playfulness to terrifying rage during the course of the film. It's an incredibly charming performance that astonishes in its utter versatility.